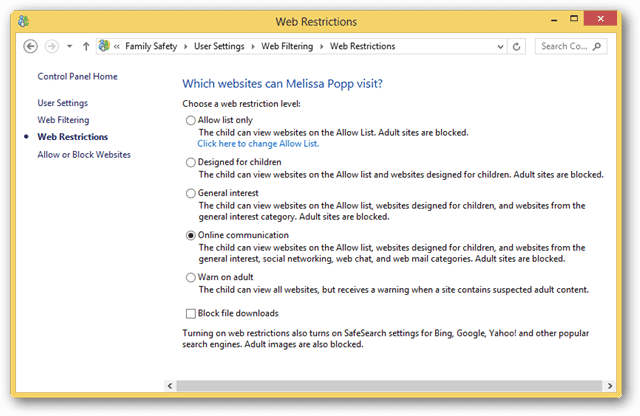 Windows 8 offers a variety of parental controls to help keeps tabs on children in your home. 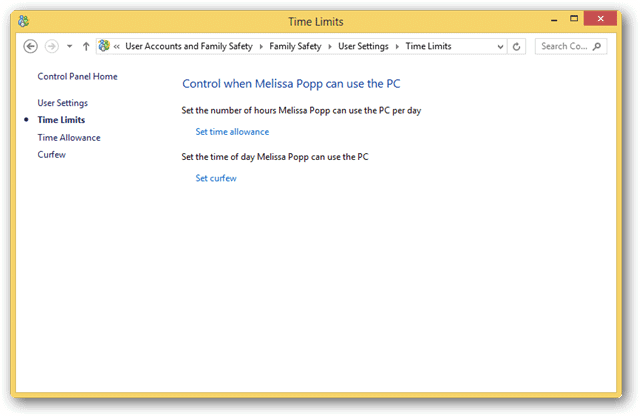 Parental controls can also be handy to keep others in check if you think they’re wasting time on a PC. Windows 8 parental controls are easy to use and utilize the Microsoft Family Safety standards the OS has utilized for years. 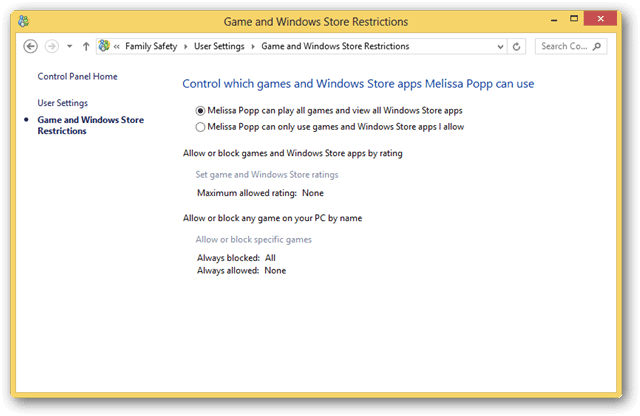 We’ll show you how to set up parental controls in Windows 8. 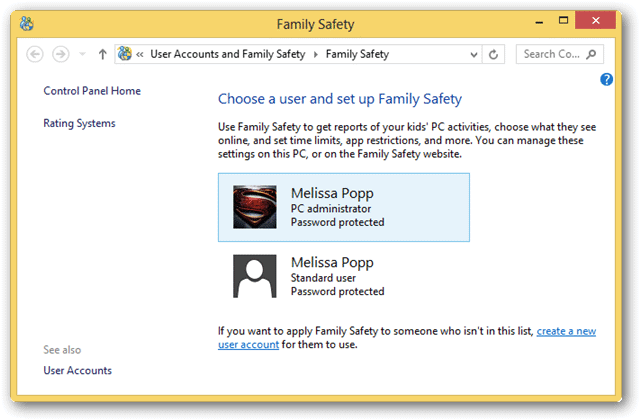 In order to open Family Safety and begin setting up parental controls, search for “Family Safety” from the Start screen. 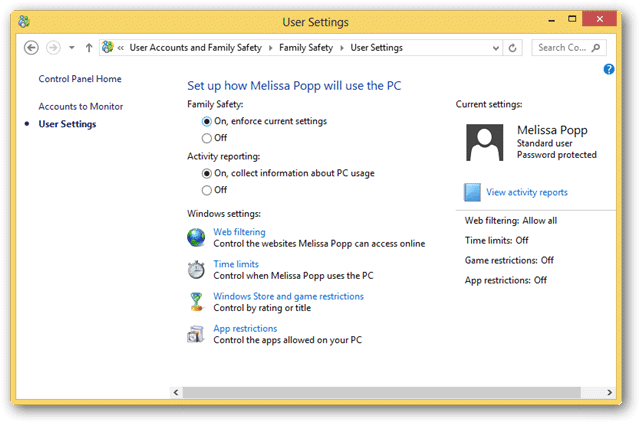 Now, you can choose what user you want to set up parental controls for. Simply click on that user to get started. This will give you some information on the parental controls associated with that account. Click “On, enforce current settings” to turn on parental controls for the account in question. This will turn on everything previously grayed out light up, so now you can go through each setting one by one to tweak parental controls to your liking. We’ll start with Web filtering, so click on that. To the left, you’ll be able to navigate back to the main Family Safety screen and also go through each setting under Web filtering. Web filtering allows you to set what type of web sites a user visits. 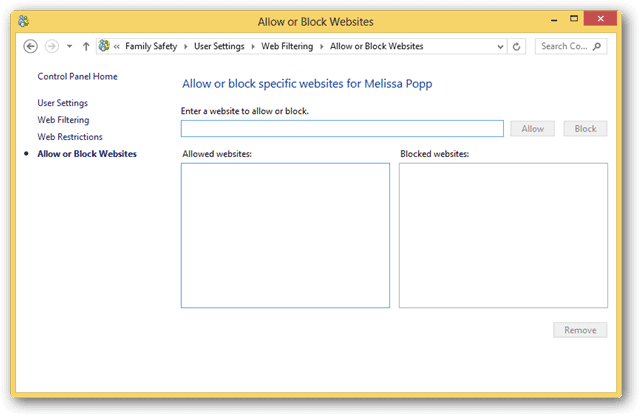 If there are specific web sites you want to block, you can do that. 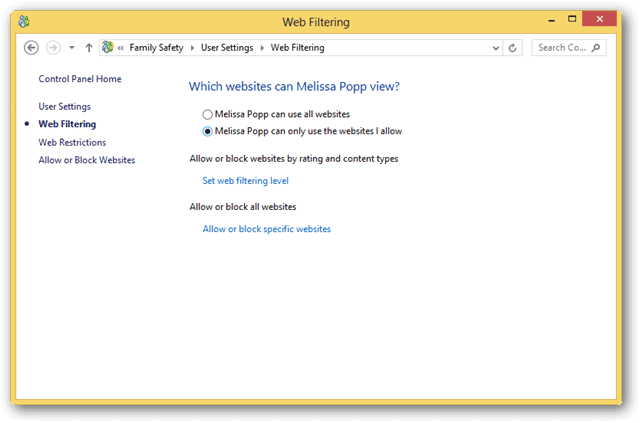 You can tweak the web filtering level to your liking. You can choose a pre-defined level, which may take some time to find the right one, or you can simply add web sites to the allowed or blocked lists. You can build your own white or blacklist of web sites the account can or cannot access. If the filters are causing issues, it could be easier to start this way. You can limit the amount of time a user spends on a computer. When the time is up, they will be locked out of the PC for the pre-determined amount of time. 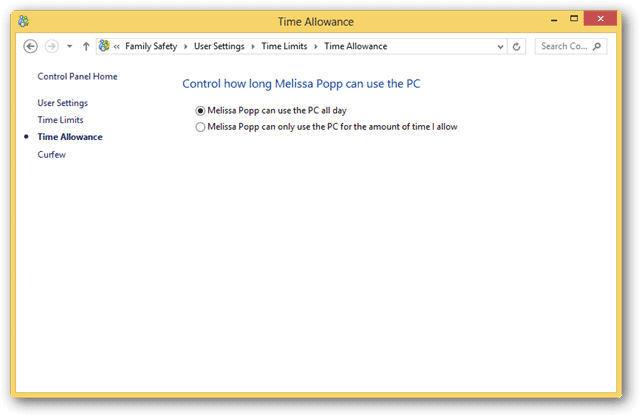 You can choose to set time limits for being on the computer or you can choose to let the user stay on all day. 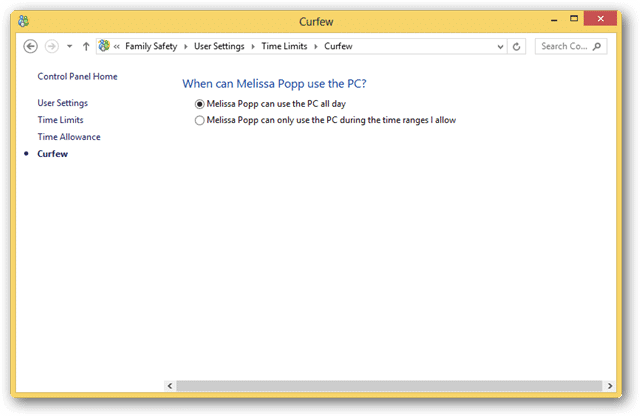 If you click “Curfew,” you can then let the user utilize the PC all day but be locked out during certain timeframes. This area will allow you to choose what game rating users can play in Windows, along with allowing you to pick and choose what games can be played. You can also set rating levels or simply block all gaming on your PC. You can now limit what apps a user can utilize. Any app required by Windows can still be used but others will not be able to be loaded. Family Safety also allows you to view activity on a user, if activated. As long as “On” is checked for Activity reporting, you can then click “View activity reports” at any time. Do parental controls actually work? Parental controls, no matter the OS, only work when you also explain why they are put in place to begin with. 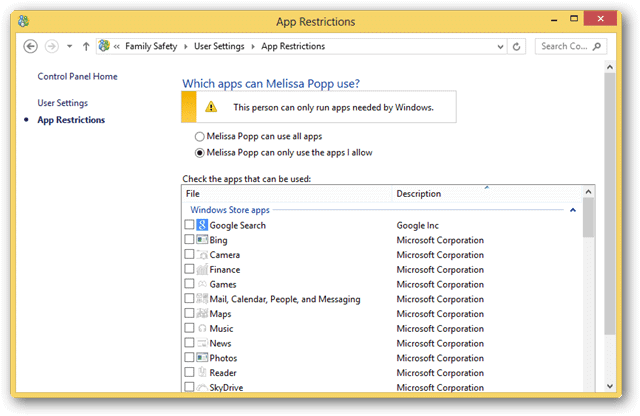 Children are smart, and they can find ways around parental controls, even what Windows puts in place. 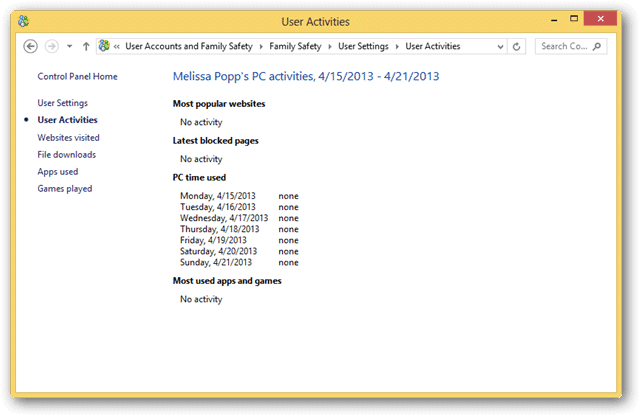 Parental controls are just one part of monitoring what your children do on a PC.